Wish dey wuznt so fuzzy, tho. Tikklolz teh froat. Adn congrats, catena! Conga rats to AP adn catena on a noshpishus tye. Mebbe we shud beem dem ober to teh Klingy ship ware dey will be no tribbul at awl. Big bubblols? No tribblols !! Yoo meens tribblols duzunt stikk to yore fais? *feedz sum tu a tribblol* No, it meenz teh gum duznt stikk tu teh tribblol wen it farts. Um, hao yoo noes witch end it, um, comes owt, um. . .nebber mind. For non-Trekkiez, heerz a lolspeek summary ob teh eppysoad. OMCC, AP!!! Aiz fawlin on teh floar laffin! Ware yoo find dese jems? Adn wyol wun ob mai faybrit seenz (derz so menny gud wunz in dis eppysoad) is teh bar fyte (bofe hao it starts adn Cyrano Joanz weevin fru it), Kirks interrogayshun afturwurd is a troo klassik tuu! Adn wiff dat, ai is awf tu anubber performinss (we kloaze tumorro). Bai fur nao! Fanks. AP. Brake a leg! How u even kno to luk fer such afing? Dat am faztazmagorikal!!!! Ai tu wuz laffin mai but (!) awff!! Ai showd it to Hubcat adn he laffed, too! Dey tasted like ice cream of many flabors! 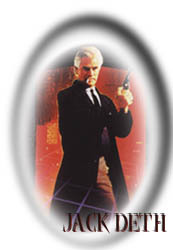 Jack, yore pomes am teh best! 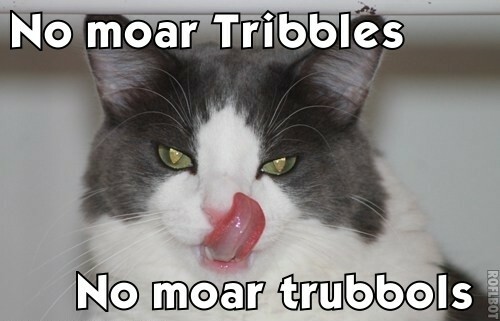 A nom is a tribble fing to wayst. *tries agin* A nom is a Tribble fing to wayst. Mai noms alwaes goes tu wayst. Adn hips. Adn thys. Et. Cetera. Mebbe hi will hork it in de katboks. Awl mai gurls awr traind tu onlee horking in de katboks. LOL! Beleeb it oar nawt, mai Smudj yooshully mayks it to teh vinyl floar in teh kitchen before he hurks. Mai Mindy, awn teh ovver hand, alwais channels Regan in “Teh Exorcist” adn just lets it fly. Seh lieks to see hao menny sirfusses seh can hit wif wun hurk. Aifink teh rekord am (1) teh wall, (2) teh wind’oh sill, (3) teh wind’oh, (4) teh carpit , adn (5) a chayr seet, awl in wun swell foop. Ai speshullee enjoys de stand-awn-de-bakk-ob-de-cowch horks dat hits sebral cowch pillos adn wattebur afgan oar blankit happins tu be dere. Ermigerd! Yoo has been to mai howse! an theyz probly makin more bebbeh hayrballz in chesters tummy az we speek.